Your generous support helps keep the lights on! 1. Donate Now! - if you know what you want to do, use this to head over to paypal and make an immediate, one-time financial contribution (or set up a recurring schedule). 2. Not sure what, when, or how to donate? Contact us via email. We'd be happy to work with you on finding the perfect way to support our mutual goals. 3. Prefer that old school telephone way? Our staff loves to talk! Give us a call at 802-476-8188. 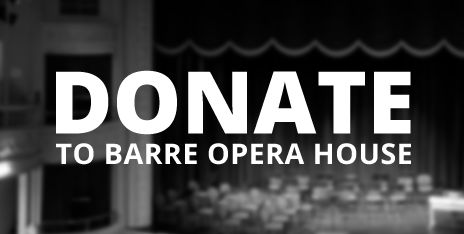 The Barre Opera House is a 501(c)3 non-profit organization. Any contribution of money, large or small, is a tax-deductible gift that benefits you, the Opera House, and the community. What is Planned Giving? The term 'Planned Giving' applies to charitable gifts that are carefully planned and structured to provide the best possible scenario for both the donor and recipient. Whether a donor uses cash or other assets, such as real estate, artwork, or partnership interests, planned gifts can provide valuable tax benefits and/or income for life. Charitable Bequests: A bequest is anything you give, or leave to charity from your estate through a will or a living trust. You can arrange to bequeath a gift from your estate in several different ways including: setting aside a specific dollar amount, leaving a percentage of your estate, gifting something you own such as real estate, artwork, a car or jewelry, or by leaving a paid life insurance policy or other financial investments, such as stocks, bonds or CDs. Charitable Remainder Trusts: These trusts allow you, and/or other designated beneficiaries, to receive income from a trust for your lifetime, or for a period of years not to exceed 20. Charitable Lead Trusts: Allow you to designate a charity to receive a regular, fixed amount from a trust for a specified time period or the lifetime of a designated person. Gift Annuities: Allow you to contribute funds or assets to a nonprofit organization, and that nonprofit in turn makes fixed annuity payments to you from its general assets for the rest of your life. We'll be launching a capital campaign in the next year that will help to fund several major facilities projects, including painting of the theater (for the first time since 1982), installation of a modern rigging system, and new lights. The new lghts will be safer and more energy effiient, saving the Opera House hundreds of dollars a year in electricity costs. For more information, please call our office at 476-0292. Do you have an item, product, or service that could help the Barre Opera House in our daily operations or fundraising efforts? Give us a call to see what our current needs are, or to inquire whether your item might be of use. Common items include gifts of artwork, gift certificates, and items for our annual silent auction. We invite you to become a member of the Barre Opera House Family. It is through visionary gifts that we are able to achieve our goals. Please consider helping us as we strive to fulfill our organizational mission, namely to sustain operations, strengthen our community, and build a strong cultural legacy for future generations. Contact our Director by phone at (802) 476-0292, or via contact us.